United Bank Service (UBS) provides a broad portfolio of merchant banking services and business solutions to help our clients expand payment options to increase revenue. One popular service is our Bank Card program, a PCI Certified payment and transaction service, serving businesses at local levels and nationwide; currently handling merchant accounts for over 60,000 merchant locations and processing in excess of 4.5 billion dollars annually on VISA MasterCard. We value each merchant we serve, realizing that great pricing is just as important as exceptional customer service. Our staff provides outstanding customer service and technical support 24 hours a day, 7 days a week toll-free, completely free of charge. To maintain the best call coverage hours and redundant support, UBS with our partners have multiple support centers in New Jersey, Seattle, Pennsylvania and Arizona. Each account will be underwritten by designated major VISA/MC Acquirers, including but not limited to US Bank, Wells Fargo Bank or First National Bank Omaha, providing you strong, stable and timely deposits. Participating card association network included on your terminals:. If you run a shelter-orphanage or provide immunization, food, health or emergency, please visit Non Profit Special Projects. NEWS: UBS selects Unicef Inspired Gifts as the charity choice. Merchants can also choose to contribute by per transactions, donating to the American Cancer Society, Make-A-Wish Foundation, National Federation of the Blind and National Cancer Coalition for each merchant account. You can select your contribution on your application. UBS was one of the first to introduce iPhone Apps as a terminal in 2007, when the first iPhone was introduced January 9. Accept credit card via iPhone is now available. UBS program afford to receive fair rates, exclusive discounts and mutual benefits. works collectively as an entity to reduce merchant rates and to negotiate vendor buy rates. This is one of unique benefits; knowing that you will always receive a fair stable rate with UBS. Merchants can now leverage the UBS verification system and free search engine listing for free. UBS released the Client Partner system. The system provides a platform to share and communicate with merchant on best practices and news. UBS launched the wireless merchant solution integrating with AuthorizeNet. If you take a lot of credit card orders at trade shows, flea markets or on delivery, you can get those sales processed and approved immediately, on the spot, so the money is on its way to your bank account. We continually look for ways to improve our service and with this goal in mind, we will now be issuing a DialPay® account instead of our previous voice authorization service. DialPay® is an Automated Response System, which can be used when a merchant requires a voice authorization for Visa and MasterCard Transactions. This system enables merchants to utilize a touch-tone telephone in the same way they would use a POS terminal by following voice prompts and entering the appropriate information on the telephone’s keypad. DialPay® transactions are authorized and settled simultaneously, over the phone, eliminating the need for merchants to “Force” the transaction after the voice authorization is entered. Casio integrated Electronic Cash Register (ECR). 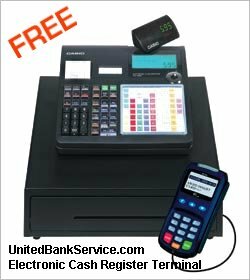 A free integrated cash register system that also manages all functions of credit card processing. 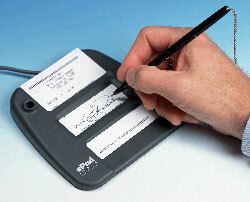 All credit card transaction signatures are electronically stored and transmitted upon day-end batch out. Never have to provide proof of signature again if a customer charges back! Retrieve electronic copies of your receipts & signatures online! The CHARGE ANYwhere package combines a magnetic credit card reader with the popular BlackBerry™ class RIM 850/950 Wireless Handheld™ to create a compact, rugged and mobile device. 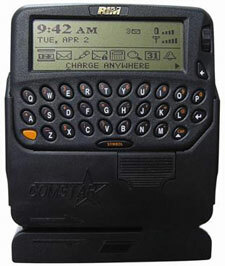 At the heart of the CHARGE ANYwhere solution is Comstar’s state of the art Gateway. The Gateway connects customers in seconds with credit card processors for rapid authorizations, and processes data for real-time use with the Web-based transaction management system. Coupled with state-of-the-art industry specific operating software and an innovative and secure Web-based transaction database and reporting system, the CHARGE ANYwhere system is packed with features.